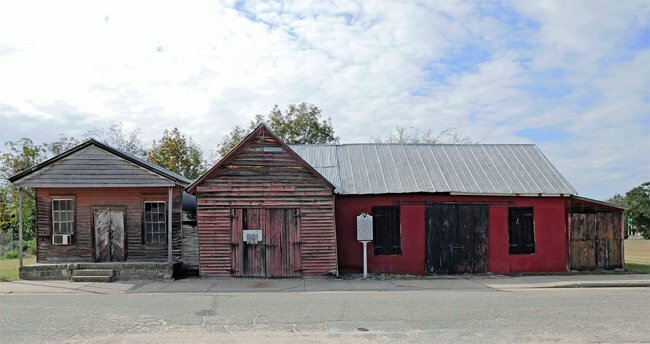 A small complex with a big name, Senn’s Grist Mill, Blacksmith Shop, and Orange Crush Bottling Plant is located at 3 Cantey Street in Summerton. Summerton is located in Clarendon County. Senn’s Grist Mill, Blacksmith Shop, and Orange Crush Bottling Plant is a small commercial complex comprised by three interconnected early twentieth-century buildings of similar size and construction that retains its historical appearance and character. Commercial activity at 3 Cantey Street began about 1903, when John G. Senn opened Senn’s Blacksmith Shop for business. Senn’s Grist Mill, Blacksmith Shop, and Orange Crush Bottling Plant played a role in the commercial development of Summerton, South Carolina, during the early twentieth century. The grist mill, ca. 1905, the most significant enterprise at the site, recently closed its doors after nearly a century of continuous operation. It is an outstanding example of the small independent grist mills that were commonplace in rural communities across the South in the late nineteenth and early twentieth centuries. The blacksmith shop and bottling plant, ca. 1921, are typical of early twentieth-century light industrial buildings. Senn’s Grist Mill, Blacksmith Shop, and Orange Crush Bottling Plant occupies an important place in Summerton’s civic memory. In supplying the local agricultural sector with essential goods and services for nearly a century, each of the three enterprises at the site made significant contributions to the economic and social development of Summerton. Many thanks to Bill Fitzpatrick of Taylors, who took this beautiful photo in 2012. Bill enjoys the singular distinction of being the only person ever to have visited all 1,400 of South Carolina’s National Historic Landmarks. He has published several helpful e-books which serve as invaluable travel guides to the Palmetto State.